Lesley Pymm reports: What a great weekend. We started with Newbury parkrun which is held on Greenham Common. The run actually starts on the runway (which was the longest runway in Europe) and then is a single lap route that goes through woodland and common land before coming back to the runway. There were cows there, but no need for a marshal as they were very well behaved! Sunday, and it was off to Kingsclere for the Hampshire Hoppit 1/2M. The marathon had started an hour earlier, so as I arrived I saw them heading off up the first hill. That was something to look forward to! Someone on facebook had asked if it was runable and the RD had said that it was barely walkable!. I had been looking forward to this run for ages. It goes over Watership Down and sounded really good. 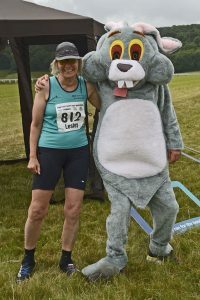 It was well organised with loads of loos – sorry no BvH loo photo but I did get me with the bunny! The race HQ was at a stables. As we waited for the start, there was a red kite flying overhead. It was a brilliant sight. The first part of the run took us along the gallops and then into woodland. We slowed to a walk at this stage as there was a bottleneck. Then we got round to the beginning of the climb. For those who have done Mortimer Forest – it is similar to that climb. There were amazing views from the top and then we ran on the Wayfarers Walk for about three miles. At some more gallops we turned off and ran south over fields and trails. There was a section of road that came as a surprise to me, but was very well organised with partial closure to traffic. Off the road and it was back onto the trails to continue south and then east on the Harrow Way. At this stage, the faster marathon runners shared the route. Lots of encouragement as they passed me – they were so good. I was pleased to get to the next feed station as this was where the two routes separated again and I was not being constantly passed. The bad news was that this was another long road section. Eventually I turned off the road but the path was hard gravel so just as bad underfoot. I was very pleased to eventually turn off and staft running along the downs again. Eventually I came to the top of the hill we had climbed at the beginning. This should have been easy but my knees had really had it by then and getting down was so painful. At the bottom it was then a lovely run through the woods again and then a run back along the gallops to the finish. 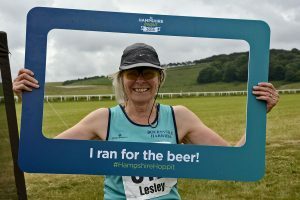 There was a goody bag with very welcome bits of food, bananas and a medal (enormous) but best of all there was a 1/2 pint glass which I could have filled with Loddons Hoppit Ale – lovely. The marathon runners got a pint glass, but 1/2 was quite enough for me as I was driving back to where we were staying. However, they did announce that we could have another refil if we wanted, so Mike was very pleased of that as he had got quite warm walking on Watership Down whilst I was ‘enjoying myself’. It was a tough run and I was pleased that it was over! It took me about 3hrs 11mins, but really was beautiful out there. I just hope my knees have recovered before the fell race on Wednesday! This entry was posted in Half Marathon, Multi-terrain, Race Reports, Trail by Race Reports. Bookmark the permalink.